Bad news for quilters in the Geneva area: the Manoir aux Tissus, the only decent and friendly quilt shop in Nyon is closing down in September. There is now one other quilt shop left around here, also in Nyon, but it is not half so welcoming or bright, (but it’s fine if you want to learn how to make decorative loo-roll holders…) Bother, bother, bother. Anyone around here have a good business idea? Like setting up a sort of centrally-located quilting lounge with little stock but great support and classes, design walls and ironing boards, cups of tea and biscuits, an internet connection for ordering fabric and a few samples to fondle, and friendly pixies to help out? Amazing that a place like Geneva cannot even have one single decent quilt shop, and only one really uninspiring (and inevitably overpriced) fabric shop. Online shops are marvellous, of course, and we all use them, but surely there is space for some sort of other business model that builds community, local skills and creates some buzz about crafting? 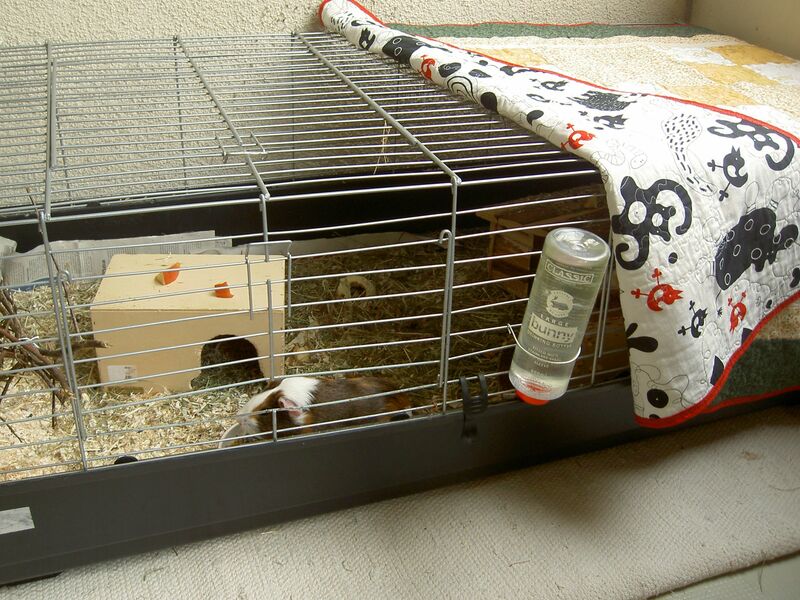 The guinea pigs on the balcony are joining me in looking a bit sad, safely bundled from the lousy weather under their quilt.